The certificates are back from the printer, and they look good! They have a blue border with dark blue and black printing on a heavy, light grey card stock. The seals are embossed gold foil and are applied separately. The seals look very sharp. The actual certificate doesn't have the dark brown border, but it is positioned so you can use a nice frame for your wall or desk. The whole thing looks very attractive. We've held the BSD Associate Exam at three conferences so far- SCALE, FOSDEM, and Linux-Tage Chemnitzer with over a dozen candidates. All the exams haven't been scored yet, but they should be finished in a few days. Those sharp enough to pass will get one of these certificates as soon as we can send them out. The next conferences to host the BSDA exam are Flourish (Chicago, IL, April 4-5, 2008), IT360 (Toronto, Ontario, Apr 09, 2008), NLUUG (Ede, The Netherlands, May 15, 2008), and CONFidence (Krakow, Poland, May 15, 2008). See the list of upcoming conferences, and register for a BSD Associate exam at https://register.bsdcertification.org//register/events. Cost of the exam is $75 USD (or half that if you took the beta exam). More conferences are being added all the time, so check back frequently to see if there is a conference near you. If not- let us know! Select the Info subject through the "Contact Us" page at http://submit.bsdcertification.org/contact. Remember, you have to obtain a BSDCG ID before you register for an exam. The BSDCG ID is free, and we keep your ID information private. It is not shared with anyone. 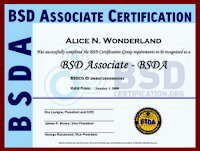 As always, more information on the BSD Certification Group and the BSDA exam is found at www.bsdcertification.org.